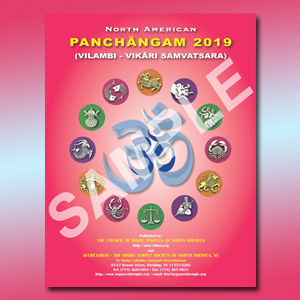 The Hindu Temple Society of North America has released the Calendar and Panchangam for 2019. The HTS Calendar and Panchangam are known and trusted for accuracy and are used by thousands of users countrywide in the USA. 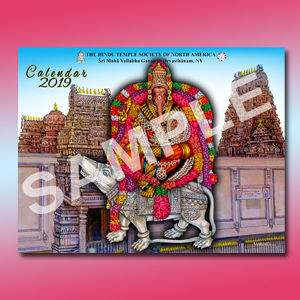 Devotees may purchase the Calendar / Panchangam from the Temple Counter or Gift Shop on all days. 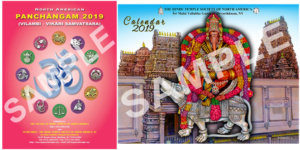 You may also order either the Calendar or the Panchangam or both online right here. The prices include shipping charges. Please click on “ADD TO CART” to add product(s) to shopping cart and then “VIEW CART” to check out. We ship products within 2 business days by U.S. Postal Services and it may take 2 to 10 days to arrive depending on the destination. NOTE: All prices listed (shipping charges included) apply to orders shipped within the USA ONLY! Orders shipping outside the United States MUST PLEASE contact the Temple directly at: (718) 460 8484 ext: 112 or 102. Please note that multiple / bulk orders are not available online. If you wish to order multiple copies and for any other information, please contact the Temple directly at: (718) 460 8484 ext: 112 or 102.